How do these fermented foods help improve your gut health? It helps to think of the process used to create fermented foods as the same process your gut uses to digest foods. Think of your digestion as your internal fermentation system. Historically the fermentation process was used as a method to preserve foods. It’s history goes back thousands of years and across many cultures. The fermentation process works by producing short chain fatty-acids which prohibit harmful bacteria from growing. At the same time these short-chain fatty acids produce the ideal pH to encourage good bacteria to grow. This is the reason adding fermented foods and probiotics to your diet is a great way to improve the environment in your gut. 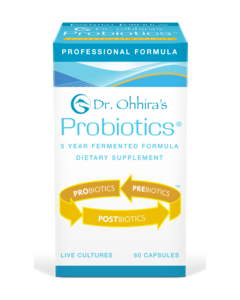 One probiotic on the market, Dr. Ohhira’s Professional Formula, takes this fermentation process a step further by feeding their 12 strains of bacteria for five years. 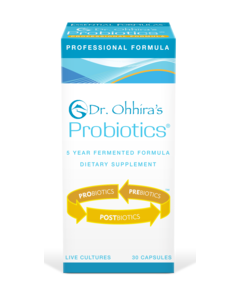 We talked with Ross Pelton, the scientist for Dr. Ohhira’s probiotics, about the fermentation process and how it works in our digestive system. He says that the first step in changing your ‘pathobiome’ (unhealthy microbiome) into a healthy microbiome is to change the environment. You need to replace the environment by changing the acid balance so it’s no longer favorable to bad bacteria.